Q I'm in a serious post-election depression. Thank goodness marijuana's been greenlighted. What other pick-me-ups can you recommend? A Our founding fathers wrote the pursuit of happiness into the Declaration of Independence, so it's our civic duty to pursue it, even in these challenging times. Folate, magnesium, zinc and vitamin D -- the vitamins, minerals and amino acids linked to good will -- are legal, abundant and available without a prescription in pulses, spinach, mushrooms and seeds. Think of these mild-mannered foods as superheroes of uplift in disguise. All pulses (dried beans) contain folate but lentils, the tiniest of the pulses, pack the most. Folate, a vitamin, also known as B-9 (like benign), increases serotonin production, which releases happy-making neurotransmitters in the brain. All that, plus lentils come loaded with fiber and protein, need no presoaking and are the quickest-cooking pulses, providing satiety -- that's the happy belly feeling --reason to be cheerful right there. Greens like spinach offer folate, too -- think of foliage, leafy, abundant greens. They're also goldmines for magnesium, a mineral that dusts away depression, so you get a double dose of well-being. And it's so easy. Spinach plays well with others in salads, smoothies, soups and stirfries. Zinc, a mineral that makes your skin and disposition glow, is found predominantly in foods vegans don't eat -- except for lentils -- there they are again -- and seeds including sesame and pumpkin seeds (aka pepitas), which deliver magnesium and also make you smile by way of crunchiness and luscious healthy fats. Vitamin D, is called the sunshine vitamin because our bodies produce it naturally when our skin is exposed to sun. Vitamin D also adds some sunniness to our nature. Sunniness can be hard to get, regardless of who your presidential candidate was. Dermatologists and sunscreen manufacturers urge us to limit our time in the sun and most D-rich foods aren't vegan or animal-friendly. Cheer up, mushrooms offer delicious vitamin D delivery. The darker and chewier they are -- like shiitakes -- they more D they have, but all mushrooms, including your basic, affordable white mushrooms, offer pleasure with their heady, funky aroma, like sweat-warmed skin and their meaty but meatless chew. Skip supplements -- they're not proven performers. Lexapro, Effexor, Wellbutrin and their pharmacological friends come with scary side effects. Lentils, spinach, seeds and mushrooms interact with our bodies naturally, synergistically, magically. They give us a bigger, better jolt, taste better and give the happy, drowsy post-Thanksgiving tryptophan feeling without harming a turkey. One bean burger alone won't haul you out of the dumps, but you can count on lentils, spinach, seeds and mushrooms. These mood-boosting, body-supporting besties will be there for you for the next four years and happily ever after, besides. I have not one but two lentil soup recipes in Feeding the Hungry Ghost, one basic and one scented with Indian spices. 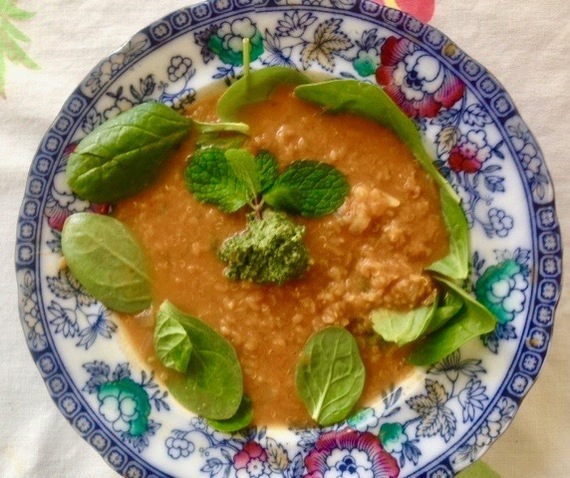 I have a Mediterranean lentil soup recipe I posted on my website last week. But hey, it's looking like it might be a long four years, so here's a brand new lentil soup recipe. Made with red lentils, which cook up in no time, it's rosy, mellow and velvety and topped with a zing of spinach pesto (nice tossed with pasta, by the way), it warms your body and lifts your spirits. Heat olive oil in a large soup pot over medium-high heat. Add the minced onion and garlic and cook, stirring, until the vegetables start to soften and turn translucent, about 5 minutes. Pour in the red lentils and stir, so they get the luster from the oil, then the bean or whole flour. Give everything a quick stir so the mixture forms a paste. Pour in the vegetable broth. Stir in till everything coalesces and becomes smooth. Heat to a gentle boil. Add the pinch of saffron, which needs to bloom in hot liquid, then stir in the tomato paste, paprika, pepper flakes and quinoa or millet. Stir occasionally until soup returns to a boil, then cover and reduce heat to medium. Let it cook for about an hour, stirring occasionally. Soup will have thickened and turned creamy. To make the pesto, whiz the mint, spinach, pepitas and garlic together in a food processor until they form a bright green paste. With the food processor motor running, pour in the olive oil and lemon juice. You're done. Season to taste with sea salt. To serve, place a handful of chopped spinach and mint leaves at the bottom of each soup bowl. Ladle in the hot lentil soup. Top with a dollop of pesto.